Pure Art Foundation » Pure Art Team Begins to Arrive in Pucallpa! Saturday, March 9 – The start of 24 Pure Art Volunteers arriving in Pucallpa Peru begins with our translator, Suzie Cote after touchdown on Day 1 of the the Foundation journey! The first wave of travelers are eager to explore this interesting jungle town and its warm people. The seven days ahead will focus on the building of two new homes in the slums where each encounter adds a new chapter to the Pure Art Foundation chapter. community out, curious what this team of Canadians are doing is the outskirts of town where the plot of land begins to transform into a homes for two desperate families. The wood is inspected by Leo, an expert builder from Canada, in the company of his fellow travelers. The Peruvian construction crew is already on the ground and concrete base is being poured in preparation for the days ahead. The team travels by moto cart along the dusty back roads of the community of over 20,000 people, many of whom live as squatters. Our Peruvian friend, Reuben, has returned to guide the team navigating the local network on wheels. There is much to be done for the people of this poor community where there is immediate need for a fresh water well and health center which have been identified as new Pure Art Foundation initiatives. Five Knights Productions videographer has returned this year to document the ongoing Foundation projects. 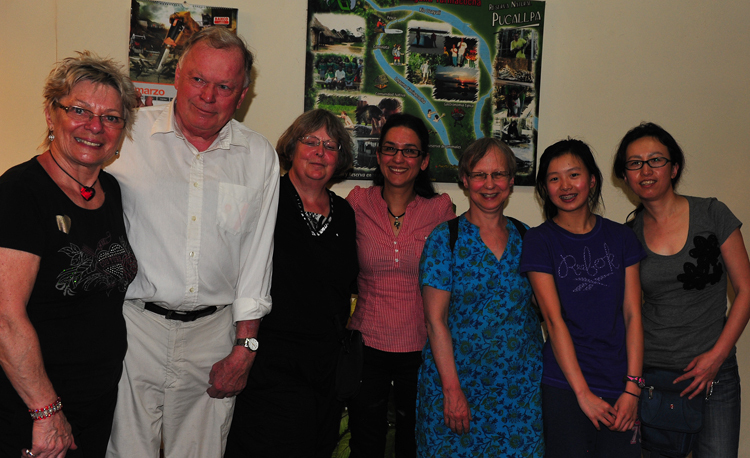 Day one ends with the arrival of group two, ready to begin their Pure Art experience in Pucallpa tomorrow!